With the opening ceremony of London 2012 nearly upon us, I have to say that I’m entirely happy with my experience of the Games to date: watching the Olympic Torch pass by. I didn’t want to miss the opportunity for my daughter Laura to see a piece of history in the making. About to turn nine the next day, she would remember the event for the rest of her life. It would also be the perfect overture to her birthday party, the theme of which was to be the Olympic Games (albeit our games largely featuring the garden hosepipe, making the most of the fleeting heatwave).The timing couldn’t have been better. And so after school on the Tuesday afternoon, we shot off down the A46 to park near my brother and sister’s houses, a stone’s throw from the Bath to Bristol road. I’d have preferred to see the Torch crossing the Clifton Suspension Bridge, enabling us to segue neatly from Laura’s current school topic (Brunel) to the next one (The Olympic Games) but it would have meant missing a morning of school. 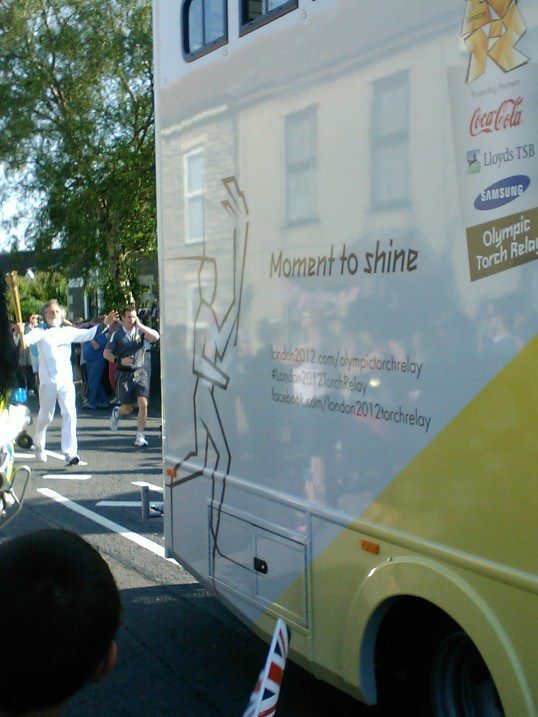 We strolled down to the Torch route at 5 o’clock and the sun was scorching. We quickly claimed a piece of (hot) pavement from which we could enjoy an unimpeded view and sat down to see what would happen next. We weren’t really sure what to expect, but somehow I thought there’d be something to imbue us with the Olympic spirit, inspiring us to strive “faster, higher, stronger”. 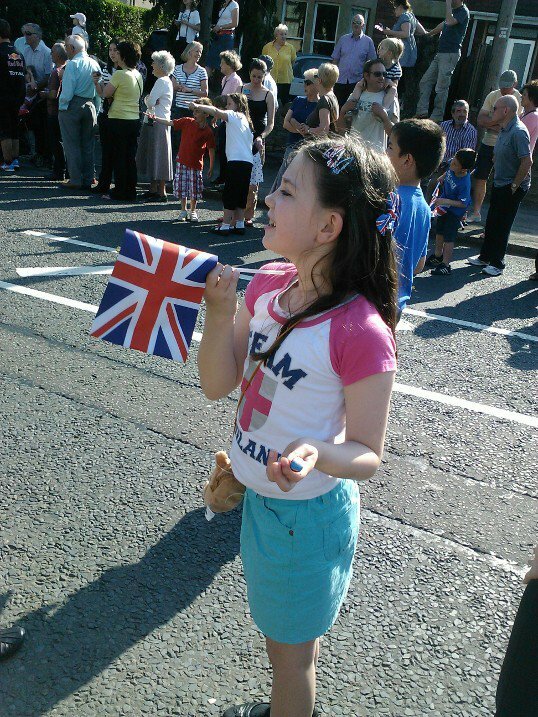 I thought there would be an international vibe to the proceedings, in preparation for so many nations coming together. I thought to myself, if this was America, there’d be marching bands with drum majorettes and baton twirlers, military precision and grandeur and pomp and show. If it was China, there’d be military might and vast crowds of synchronised dancers in colourful costumes. But this was Britain, and what unfolded was an endearingly British spectacle. Here was the general public at its whimsical British best, turning pink in the hot sun without sunhats or sunblock, tucking into Mr Whippy’s 99s and making their own entertainment. Several small children had brought along their own Olympic Torches, home-made in the best Blue Peter tradition, all sticky backed plastic and kitchen tinfoil. Many waved Union flags, dusted off from last year’s Royal Wedding and being given a preliminary airing in preparation for the Royal Jubilee. With a wry flourish, my brother produced a free promotional flag that he’d been given by a building company at the height of last year’s Will-and-Kate mania. The building company had since gone bust. Amiable security guards, armed only with dayglo yellow waistcoats and walkie talkies, ambled about the crowds, trying to look busy to justify their temp agency fee. They were clearly at a bit of a loose end. One of them, with spectacular dreadlocks, suddenly seized a home-made Olympic torch from a child and started to run along the route, waving at the spectators as if he were the official torch bearer. A Mexican wave of cheers followed him. Then a couple of cyclists, having jumped the road blocks, pedalled cheerfully along the centre of the cleared street to further applause. Finally it was time for the real thing, heralded by pairs of police cars driving slowly and officiously along. But their windows were wound right down and the policemen inside were relaxed and smiling, proffering royal waves. Then came the sponsors’ open-topped buses, understaffed, a few souls in garish uniforms looking slightly embarrassed as they waved to the crowds. But the crowds didn’t care: they just let out a rousing cheer. At last along came the Olympic bus (but it didn’t appear to be faster, stronger or higher). 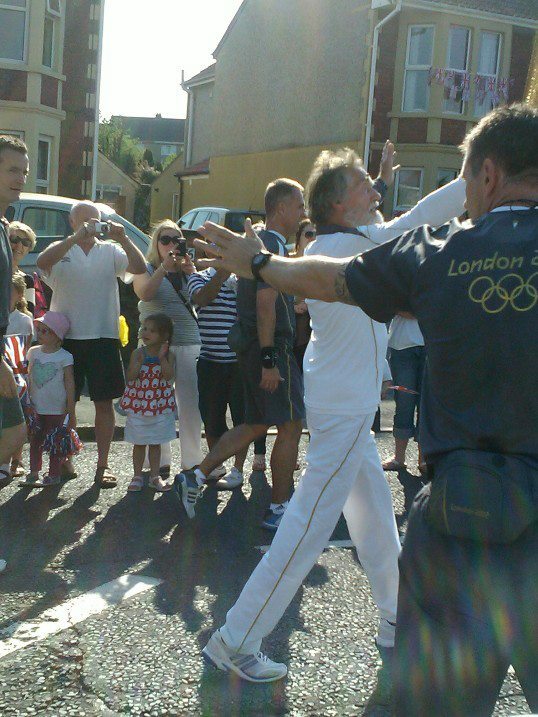 Jogging behind, holding the Torch aloft, was an elderly white-bearded sage. He looked as if he’d just come down from Mount Olympus. He waved and saluted as he trotted along, clearly savouring every moment of his three hundred metres of fame. The crowd went wild. And then he’d passed by and it was over. We all dispersed quickly and quietly, ripples of innocent pleasure radiating out through suburban streets. There wasn’t a hint of trouble. We’d all got more than we bargained for: a bit of a laugh, some unscheduled sunshine, a Mr Whippy and some community bonding. I came home very glad to be British. This post originally appeared in the Tetbury Advertiser, July 2012 edition.